A kink is defined as "a sharp bend in a line produced when a line having a loop is pulled tight". 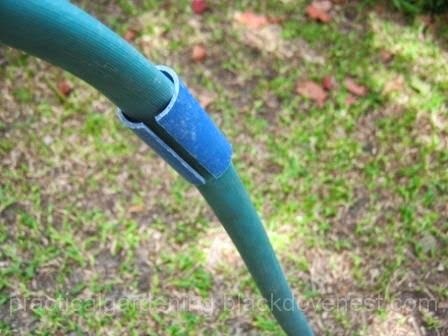 For a garden hose in use, this happens when a hose gets pulled tightly from a loop and results in the cutting off of the water supply. The way to "unkink" the hose when watering the garden is to approach the kink and straighten it, at least temporarily. This can be annoying if the garden hose is long and you need to constantly "unkink" it. 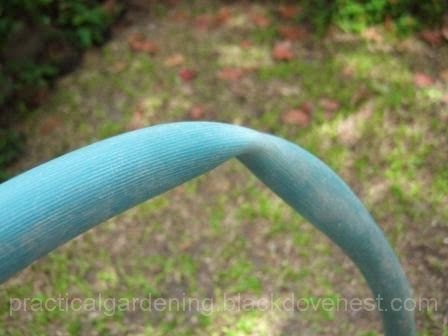 Shown below is a garden hose kink visible because of its shape and its faded color, meaning, the kink has been there for some time. Generally, kinks occur because the garden hose was not straightened out sufficiently when it was unrolled for use. Kinks may also occur when the garden hose was not rolled or stored away correctly after use. Short of replacing the entire hose, the kinks in a garden hose, unfortunately, will always be there. But there's a way to fix or "straighten up" the kinks and this is by using splints. If you view the cross-section of a garden hose, it should always be round or almost round. The cross-section of a garden hose kink has a thin oblong shape and subsequent pulling would flatten it and cut the passage of water. Keeping the cross-section round will be the job of the splint. A practical splint for this purpose is a rigid circular tube or pipe inside (pushing out the inside of the hose) or outside (compressing the hose) the garden hose. A simple and effective tube or pipe is a short pvc piece that compresses the kink so that the hose assumes a round cross-section. Shown below is a garden hose splint (blue pvc piece) that was passed through one end of the garden hose and positioned where the garden hose kink is located. The hose splint's inside diameter is big enough to allow the garden hose to slide through it. It's small enough though to adequately compress the garden hose. This way, the garden hose kink is always forced open. To do the above, you will need to remove first the garden hose fitting on one end: either the hose nozzle or the faucet connectors or coupling. 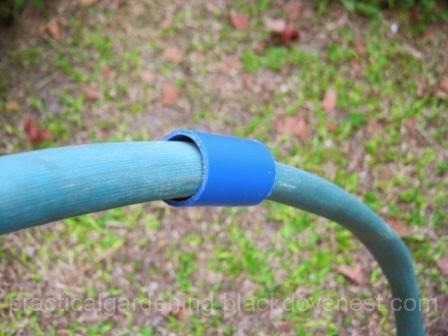 Cut several garden hose splints for as many kinks as there are on the hose and slide them through one end of the hose for positioning. What do you do if there's only one kink and it's too much hassle to remove the garden hose fittings (nozzle, connector or coupling) to allow the hose splint through? You use the same garden hose splint but cut it lengthwise. 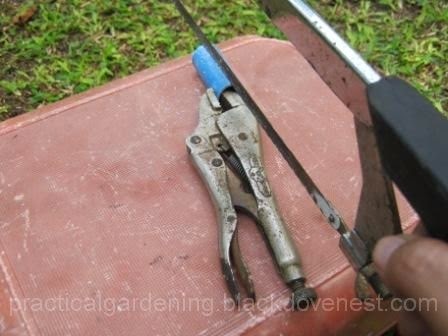 Grip the garden hose splint with a pair of vise-grips to secure it. Hold the vise-grip as you cut the splint with a hacksaw as shown below. After cutting a side of the garden hose splint, pry the slit open. You may need a screwdriver or any other tool to pry it open sufficiently. Insert the garden hose though the open slit. 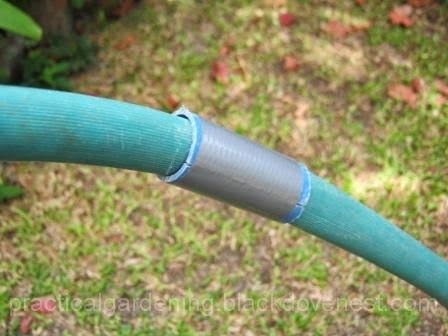 Finally, grip the garden hose splint tight while you bind it shut using duct tape.